Imagine this scenario: You are working, out to lunch, or taking your children from one activity to the next – and your phone starts ringing from an unknown number. You worriedly answer the call to find out that your father had an accident of some sort while shopping at the grocery store. You immediately drop what you are doing and rush to his rescue. This is something that can easily happen from time to time, but what happens when it starts to happen on a regular basis? This is when you know something is wrong and it’s more than you can handle on your own. There are many misconceptions and preconceived notions whenever we heard the words “elder care” and the thought of going down this path with a loved one can often feel like defeat. One factor to keep in mind is time. One of the misconceptions about elder care is that this needs to be a full time salary commitment, but this is not always the case. Maybe you have found yourself going back and forth on this issue, perhaps after experiencing something similar to the above scenario. In this case, you are clearly at an elder care crossroads and not sure whether to hire someone or tough it out on your own a little bit longer. These are difficult decisions, and not ones to make without knowing your options and doing your research first. If your loved one is still capable of taking care of themselves on a daily basis, but just needs help with tasks outside the home, hourly and part-time care is available through LifeWorx to cater to all of your needs, and be there so that you can rest easy each and every day. Flexibility is so important because you have to be able to choose what’s right for you and your loved one. When is it time for part-time care? 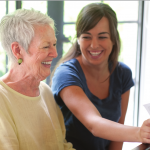 It can be very difficult to determine the key indicator that it is time to hire an elder care assistant to provide assisted living for your loved one. Is my loved one still independent? Can he/she get around safely and without struggle? Are they in need of regular medical visits (inside or outside the home)? Do they need to be reminded to take medications? Is their safety at risk because of physical or mental limitations? In this phase of aging, your loved one simply just might need someone there to assist them with small, day to day tasks. This little bit of extra help will make a huge difference in their quality of life, and at the same time let you know that they are being taken care of. Personalization is key to LifeWorx services. We’re not a one size fits all kind of business – we listen to everything you share about your loved ones – their interests, hobbies, past experiences, etc. so we can provide the very best care possible and improve their quality of life at home.